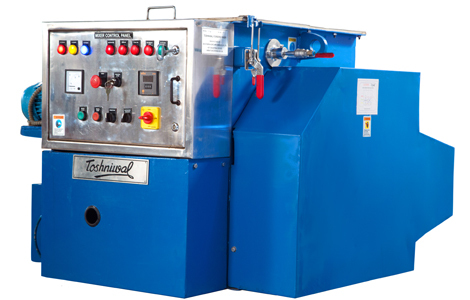 Use Toshniwal Twin Shaft Paddle Mixer for a homogeneous mix of powders, granules, extruded products, micro-ingredients and liquids, with exactly the same result. 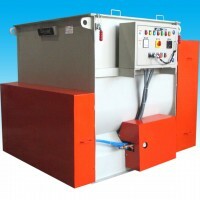 The horizontal batch mixer has two counter rotating shafts with welded paddles. 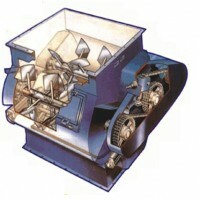 The paddles lift the material up in the centre of the mixer in weightless whirls, creating ‘’fluidization”. The particles have a total freedom of movement and fall into each other, ensuring the highest level of homogeneity. The movement of paddles ensures convectional transport of particles along the mixer, while the lift and fall of particles help to it to diffuse into each other in a very short span of time. The angled paddles of the Twin Counter rotating shaft creates a mechanical fluidized zone for homogeneous mixing, irrespective of bulk density, size or shape of the ingredients in weightless condition. No frictional no heat generation. Gentle mixing ensure no degradation of the ingredients. 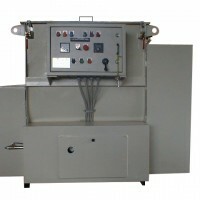 Twin Bomb door mechanism ensures complete discharge of mixed product in a short time. Pin Mill System for breaking lumps. 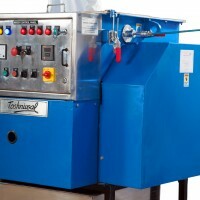 Flow Distortion Bar to create curtains of particles to which liquid is sprayed for uniform coating. Spray Bar with Nozzles for liquid addition. Jacket arrangements for heating or cooling. 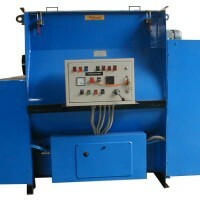 CIP System to clean interior quickly and efficiently.